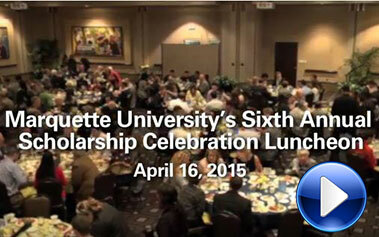 Giving to Marquette | Marquette University ? "From my first visit, I saw what a beautiful community Marquette is — one where students open doors for one another and welcome you. I knew this was the place I wanted to be." "Donor support is my backbone. Without it, I’m not sure where I would be." "When you support scholarship aid, you give students like me the opportunity to impact our world. It’s a gift that changes lives." "It means a lot to have alumni give back and help out current students. It was my dream to attend Marquette, and now I can say I achieved my dream."